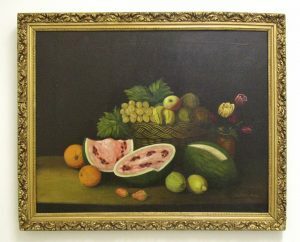 Late 19th or early 20th C. still life painting (oil on canvas) by Juan Valleio Montoya (signed lower right). Pleasing composition of basket, fruit and floral arrangement. Excellent original condition. Well made mortised stretcher and old frame (may be original). Sight size is 27 1/8″ x 21 1/4″. 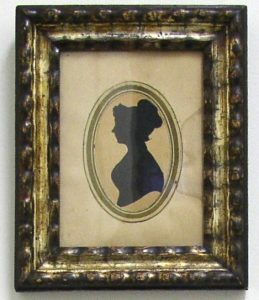 Well done silhouette of an early 19th C. woman retaining its original Mr. Seville yellow label – “cut with common scissors without drawing or machine”. 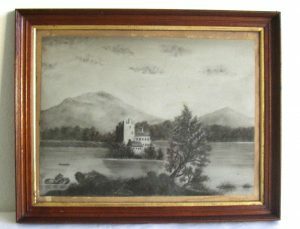 Probably its original frame. Mr. F.W. 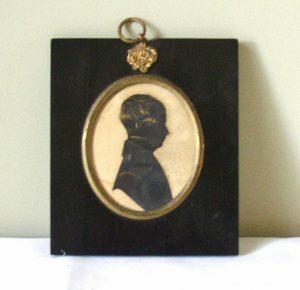 Seville was a noted English cut silhouette artist from the Lancaster area, early 19th C. From a Vermont home. 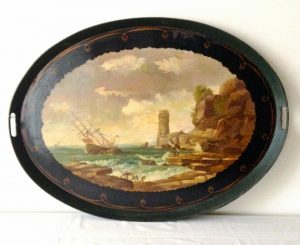 Heavy iron 19th C. oval serving tray with black background with good decoration and dark green border. The tray is centered with a well done seascape painting showing an English ship crashing on shore while groups of people on shore appear to be salvaging things from the wreck. Well done and original. A most interesting traveling game board involving a variation on the game “Michigan Rummy” or 3 in 1. Hand painted in three colors and decorated with stars, hearts and compass points. 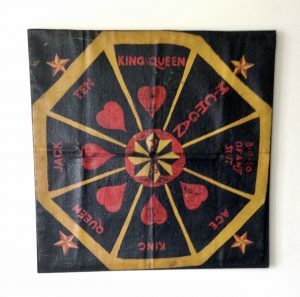 The board is painted on cloth so it could be folded and carried from place to place for illegal gambling purposes. The board is 29″ x 29″. Probably 1st half 20th C. The condition is very good with some minor paint loss from folding. It is mounted with velcro on a stretcher frame and can easily be removed. 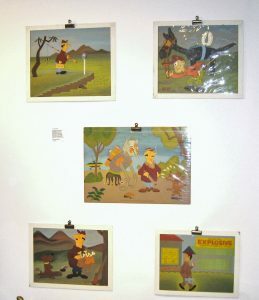 An interesting group of 5 cartoon character paintings on board of “Wingo the Dog”. These paintings were done in 1970 by Wesley L. Wing, then an inmate in a prison most likely in Illinois. There are reference stamps from the prison identifying Wing as an inmate with his name and serial number. One of the paintings (fisherman) has a label with the name Mrs. Harold L. Wing and her address in Owawa. IL. with the prison stamp and information whited out. She is likely Wesley’s mother and the painting was a gift. Very accomplished work. $160 each or $650 for all. 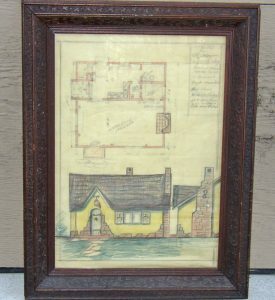 Very interesting and historical original drawing for the studio/home of O. C. Seltzer in Great Falls, Montana. O. C. Seltzer was a noted painter of the American West and a member of the Cowboy Artists of America. His paintings hang in major museums and collections and are comparable to those of Frederick Remington and Seltzer’s friend, Charles Russell. The drawing is of a plan for his studio/home in Montana. It is in excellent condition and the sight size is 18″ x 12 3/8″. 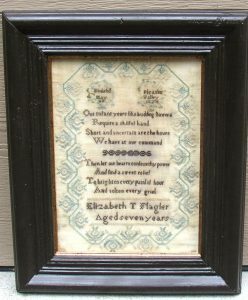 A rare sampler from Pleasant Valley, NY by “Elizabeth T. Flagler, aged 7 years””Finished May 20, 1824”. 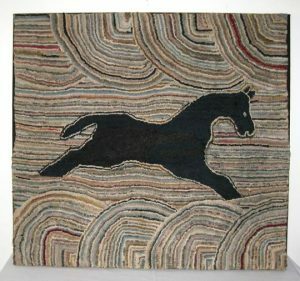 Worked in blue, tan and black silk on linen. Elizabeth was born Aug. 15, 1816 and christened March 23, 1817, in the Presbyterian Church, Pleasant Valley, Dutchess County, NY. Her parents were Abraham Flagler and Sarah Thorne, both born in Dutchess County, NY and were married Jan. 5, 1811 in the Presbyterian Church in Pleasant Valley. Elizabeth married Daniel Hall in 1846 and died in 1847. The Flaglers and the Thornes are both old prominent families in Dutchess County.